Living Grounds addresses the global issue of sea level rise by using the latest scientific discoveries in the fields of artificial intelligence and synthetic biology. 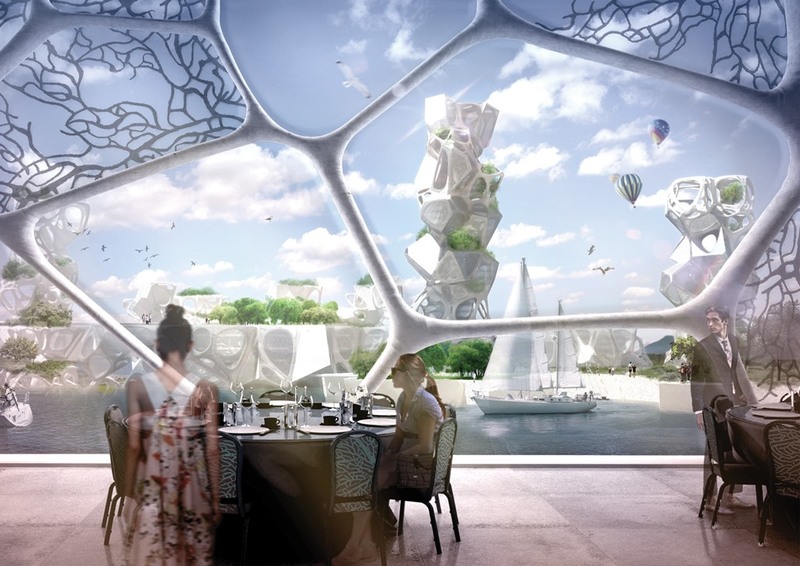 It uses an intelligent cooperative system connecting large amounts of digital data and living building organisms to create new territories for cities. The DATA offers a synthesis of variations in sea level, precise samples of the planet’s topography, a picture of the maritime flora and fauna, collected and analysed by an artificial intelligence (A.I.). The A.I. processes the data over time and pilots the living bactero-coral growth to create artificial grounds where human life is possible. Beyond its concrete application, Living Grounds offers governments, researchers, and communities worldwide the opportunity to collaborate and integrate their preoccupations in a global context. It is an opportunity to change the way we live and to live together at a local and planetary scale while reconciling humans and their environment. Hardcopy Publication New Design d’Architecture et d’Amenagement, No 20 Janvier-Fevrier-Mars 2015, pp. 138-140. Alexandru SENCIUC (architect and team coordinator), Razvan George GORCEA (architect and BIM specialist), Tudor MAFTEIANU (marketing specialist), Irene PLUCHINOTTA (environmental engineer and researcher at Bari Technical University and Paris Dauphine University), Helmi GHAMMAM (architect and 3D specialist), Andrei STAN( architectural student and computational designer), Agathe RAGUIT (architect and landscape specialist), Cristian SANTIBANEZ (urban strategist and program associate New Cities Foundation), Samia BEN RAJEB (architect, teacher and researcher, collaboration specialist at LUCID laboratory Liège University), Iris YASSUR (motion graphic designer), Arnaud Thomas (architecture student).